2015 GWAS Reserve Champion at 2 yrs old. April 2013... "so shiny it looked wet"
He has white fibers in his blanket but not consistently enough to classify him as a grey in the shows. This was his initial 'hiccup' in the show ring, when they placed him in the brown classes so that he had to endure the disapproval of the judges. We attempted to show him in Bred and Owned but did not find the consistent competition at that time that we desired for him. But, we luckily become more observant of Major's several, easily discernible light spots in his blanket that classifies him as an appaloosa pattern. Shown in the right class and Major ROCKS! His fiber was finally evaluated purely on its exceptional qualities rather than on how it did not fit in the class. From the beginning in the show ring, he was hard to categorized but well appreciated. At his first show, while he was reprehended for his white fibers in brown class, he also caught the judge's eye as "so shiny he looked wet". 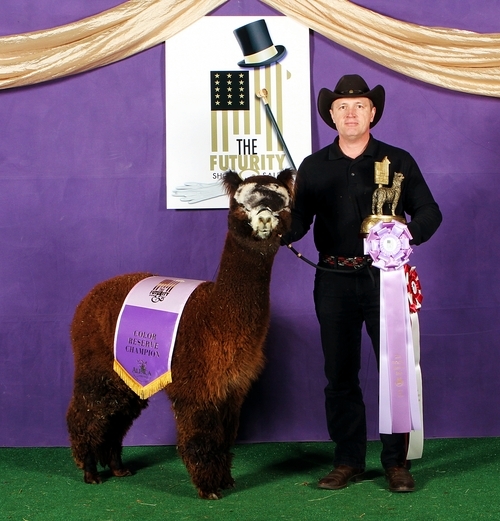 And, at the 2014 Futurity, while showing in the combined multi class, he was brought forth to the Reserve Champion position, behind the Snowmass Color Champion and before the other exemplary alpaca from farms such as Crescent Moon and Marquam Hill. 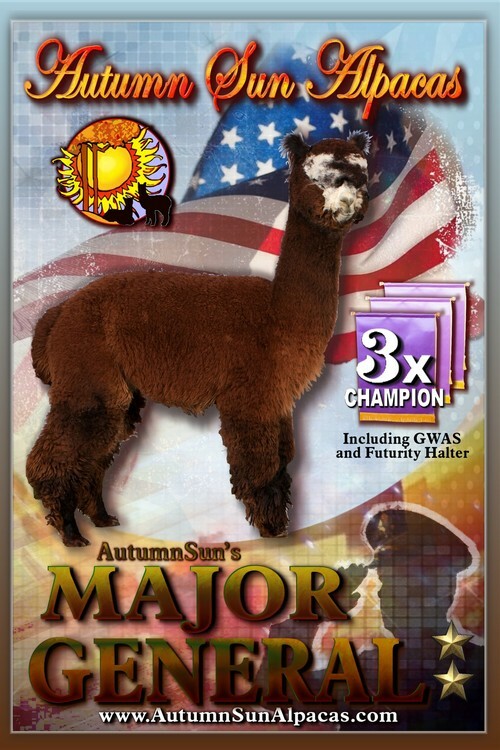 With the caliber of competition of this show we were proudly aware of Major's proper placing at the head of the pack -- clearly herdsire material manifested! We absolutely love Major for his easy personality, great looks and fantastic fiber. Being a small farm with very limited breedings each year, Major has had to elbow his way into the breeding program. 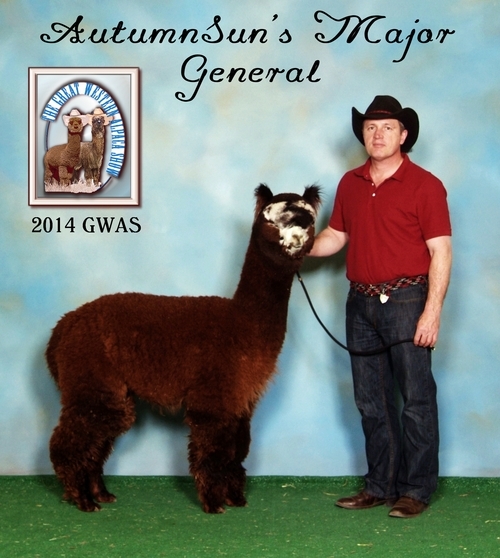 When bred to a classic silver grey dam Major produced classic rose grey male with outstanding fiber! 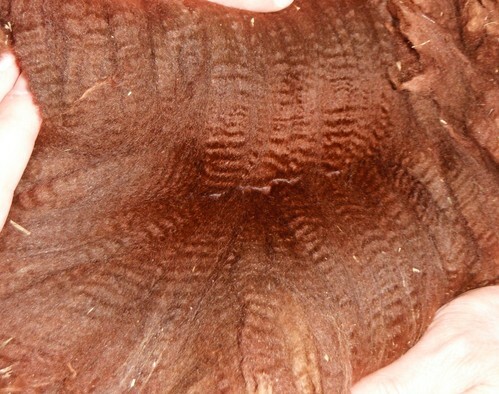 His son has extremely fine, high frequency and high amplitude crimp along a long staple in a dense fleece. 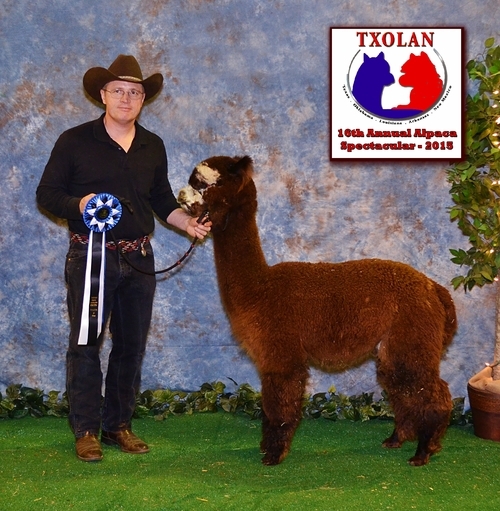 Best Bred & Owned, ABR Fall Festival, Julio Sumar -- "very nice boy"
4th - MOPACA, brown juvenile - Wade Gease.